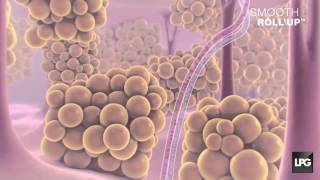 What Can New Body Endermologie Cellulite Treatment Do for Me? Are you looking for a smoother appearance of your cellulite? Cellulite, which affects 90% of women (even the thinnest and most athletic), is the result of both fat storage in the and of water retention in the body. As the cells enlarge, the surrounding tissue pulls on the skin surface and produces dimpling. At the same time, local circulation is slowed and metabolic wastes accumulate. Cellulite appears, with its orange peel aspect. During your session, your skin is stimulated which helps soften the fat cells and make them less hard. Stimulating of skin and fat tissue also helps to target fat and to improve local blood and lymph circulation. The balance between producing and eliminating fat is maintained through a natural process. Even with a perfectly healthy lifestyle, the activity of these cells tends to lessen over time. This causes an acceleration of fat storage and a constriction of lymph and blood vessels. Endermologie sessions target and slim the areas that need it most (back, arms, stomach, waist, buttocks, thighs, etc.). By stimulating the slimming cells (adipocytes), we target the natural release of fat, even the stubborn fat that is most resistant to physical exercise and healthy diet. At the same time, the mechanical action of the LPG Endermologie treatment head helps to boost circulatory exchanges within your body. The result of your Endermologie sessions will be a smoother figure without the bulges and dimpling that you don’t want! The motorized rollers of the LPG Endermologie treatment head gently stimulate the fibroblasts, the cells responsible for skin youth. Once these cells are stimulated, they begin to re-synthesize collagen and elastin, which are essential substances for skin firmness and tone. To obtain the best results it is suggested that 8-10 treatments be completed once a week. After your result has been achieved, then touch up treatments every couple months can be used to maintain your smoother skin.